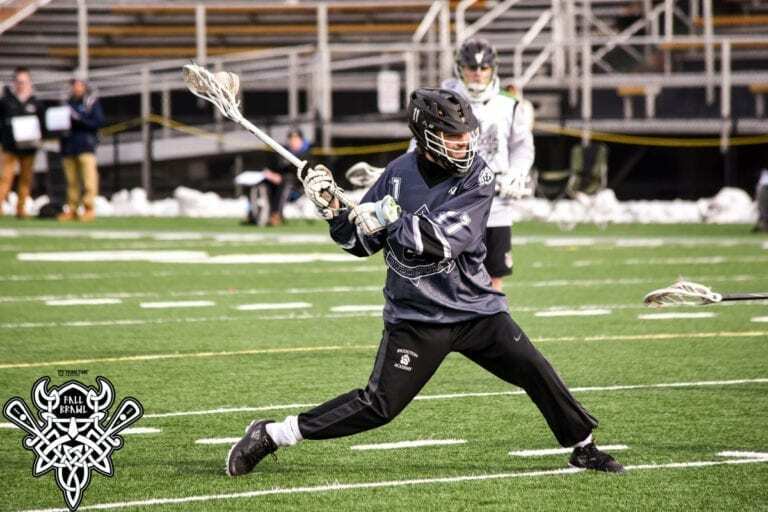 Yesterday, we told you about PrimeTime Lacrosse’s Youth Fall Brawl tournament, hosted at Bryant University. But, the following weekend saw the big boys showed up. 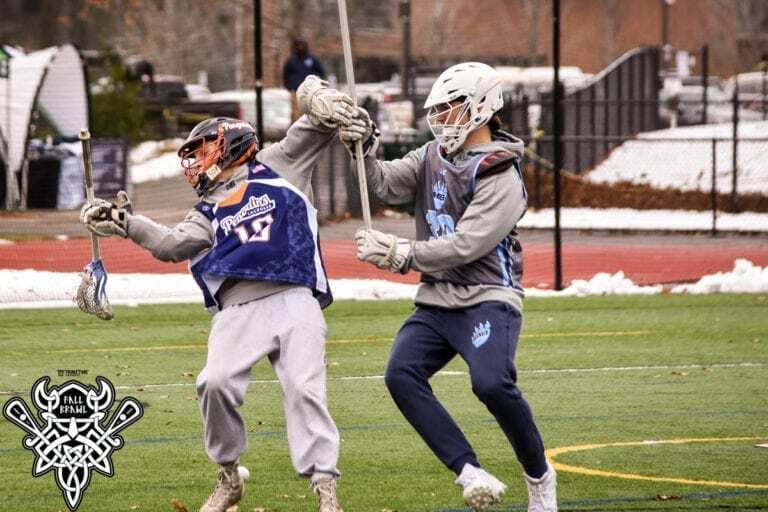 The High School Fall Brawl, covering graduation years 2019 and 2020, was definitely smaller than the youth version although each year had three divisions. The intensity was certainly higher. It also featured a group of spectators not present for the youth version: college coaches. What impressed me about the High School Fall Brawl was actually how crisp everyone still was. At this point in the recruiting calendar, you are in a bit of an odd spot. The multi-sport athletes are either coming off a fall season of another sport, or beginning a winter sport. So the athleticism was definitely there, but considering how many of the players hadn’t even played competitive lacrosse in weeks, the execution was there as well. The other part is many of the seniors already have made a college decision and many schools are filled up their next class. But not everyone. There were still undecided seniors and still coaches out there trying to fill some gaps. Add those seniors to the juniors on the field, and you still had plenty of reach for coaches from Division III, Division II, and Division I schools to check things out. One of my favorite things about this tournament was from the very first game. I walked up to it, and there were the box jerseys. It’s a minor thing, but when everyone is wearing hoodies and joggers under their pinnies anyway, the long sleeve box sweaters are great move. They may not have been reversible, but given the relatively few number of teams playing in each division, contrasting colors was not a problem. But more than anything, it looked slick. Not every team did it, but those who did were excellent, and I needed to make sure that was applauded. Now, to the actual games. 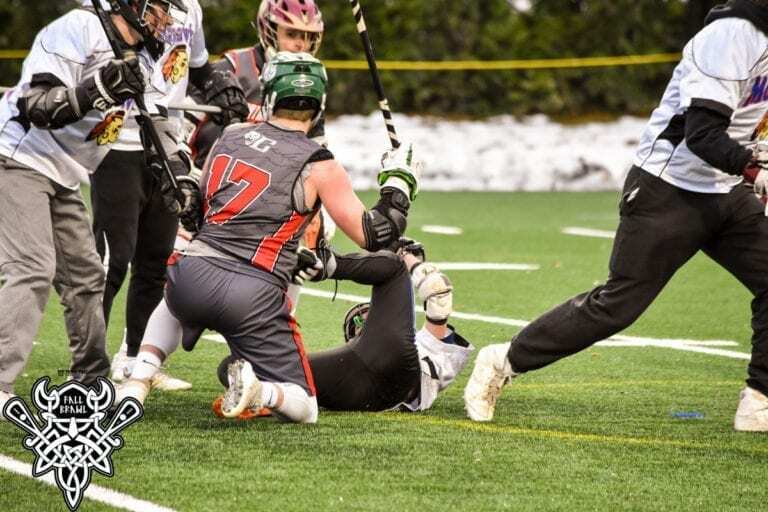 The High School Fall Brawl offered that last chance nearly all players would have to play lacrosse outside on a full field for about four months. Even having games inside Bryant’s field house was a treat, since that was still a full length field to take advantage of. From the first whistle to the last, players were taking advantage of these last hours on a full field and played hard. The play was fast, physical, and teams were trying to make the right plays to win each game. They were making sure to do all the little things right, like find the extra pass on a break, box out so your team could get a ground ball, or keep the communication flowing on defense to provide help if needed. The two most impressive teams I saw all day were the 2019 Seasoned Clams and EB Lacrosse. The Clams were littered with some big recruits from the area who already knew where they were going to be playing. That didn’t make a difference. They still played hard all over the field. From the faceoffs, to pressure defense, to the highly active offense, they were on all day long. Ultimately, they capped off the day by winning the 2019 AA Division with a 6-4 victory over HGR Blue. EB on the other hand gave a great old school feel to the tournament. Teams love being swagged out, and I already mentioned how much I loved the box jerseys some were wearing, but EB look dominant and did it all wearing plain old light blue pinnies. They only allowed 7 goals in their first three games of the 2019 A Division of the whole High School Fall Brawl. 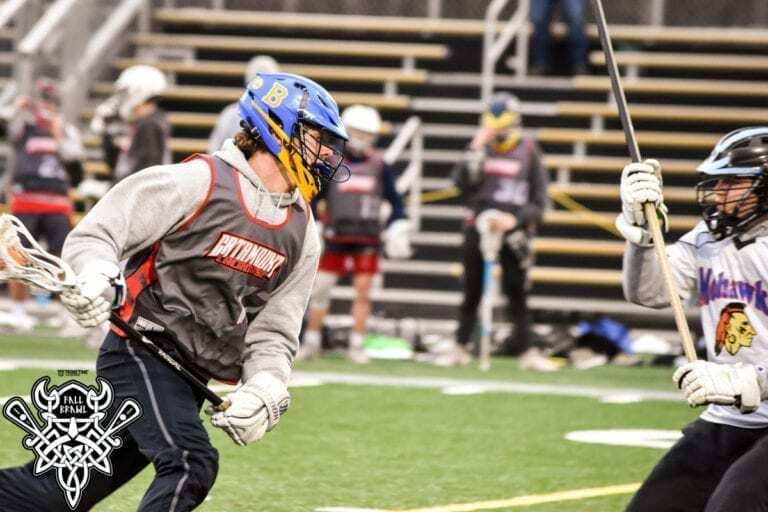 For the rest of the High School Fall Brawl, the other Clams teams fared pretty well. The 2019 B Division was taken by the Catamounts, the 2020 AA was won by the Clams ‘20 team, 2020 A had the Penguins 2020 team on top, and the 2020 B was dominated by the Clams 2021 squad. READ MORE: Read about the PrimeTime Youth Fall Brawl here.